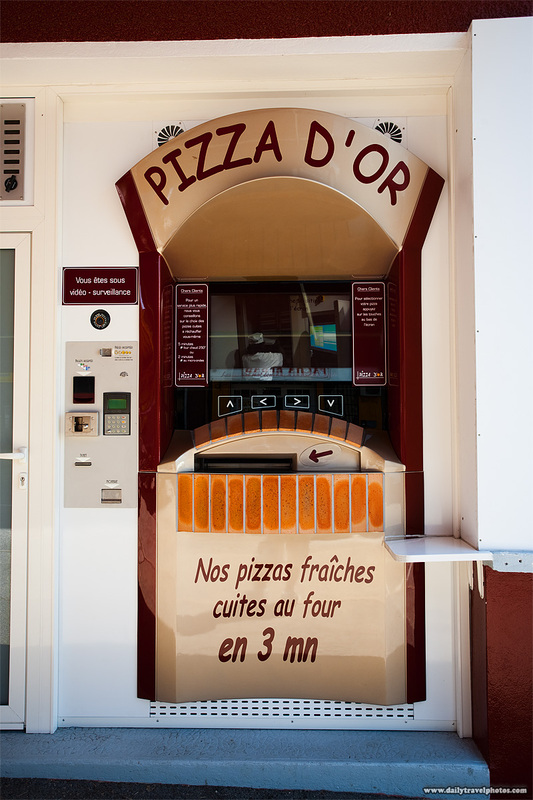 A roadside automated pizza vending machine, "freshly baked in 3 minutes." Somewhere, Italians are rolling over in their graves at the sight of this automated pizza vending machine. It wasn't enough of an insult that the space-aged touchscreen menu gently guides a hungry customer through the ordering process but in addition, the faux-brick oven facade half-heartedly exposes a metallic slot from which a machine-processed pizza is hastily disgorged with as much personal charm as a meeting of the Federal Reserve. Unfortunately, I'd eaten lunch just before the sacrilegious machine was spotted, otherwise I would've had a fistful of "golden pizza" dribbling down my chin as I took this photo.